At the beginning of Edward Cain’s memoir, his family is a central theme as he details where they lived and how often they moved around. He also shares anecdotes that give the reader and insight at the home and life of a working class family in North East England. Moving houses as his father moved to different collieries was one of the main aspects of Cain’s home life. Colliery housing is where miners were ‘put up’ whilst they worked in the pits of the area. 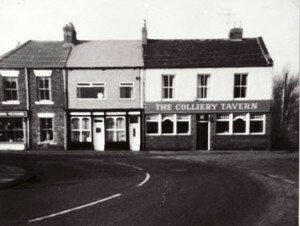 After moving to Boldon Colliery, Cain briefly details the kind of house that his family were given to live in. ‘A small house with a kitchen, a front room, and a large attic upstairs.’ (pg 3) which the family would then divide up in a way which would suit their living needs. According to Cain’s memoir, this was a ‘typical Miners House’ (pg 3) and its cleanliness was a prominent feature. He suggests, however, that other housing may not have been as well kept as their house at Boldon Colliery. Another house which Cain looks back on fondly is a house at Travers Street which had ‘3 bedrooms, kitchen and large front room, and a nice garden at the rear of the house.’ Cain states that they ‘had never lived in such good conditions’ (pg 4) up until that point in his life. Throughout the memoir, Cain tells the reader about his father’s relationship with alcohol and how frequently his family was affected by it. ‘Dad was again on the drink, and the happiness of the home was soon destroyed’ (pg 4) is just an example of the negative affect alcohol had on Cain’s family. His father’s got violence when intoxicated is evident when Cain writes that ‘a hardware dealer called every fortnight with replacements’ (pg 5) because the furniture in the home would get broken. Although this would have been an unsettling environment for Cain to grow up in, he shares an anecdote that is darkly humorous about his drunk father at a funeral. His father removed the weight from the chest of the dead body in a casket which held the body down (due to the person being ‘hump back’) which made the body rise up. ‘This soon emptied the house, believing that a resurrection had taken place.’ (pg 2) Nothing else is said about the aftermath of this. However, Cain writes about this incident in a blunt way, which portrays his father in a cartoon villain manner. Even though Edward Cain’s home life is tinged with negativity, at the beginning of his memoir he shares a story of when his dad was in a mining accident but would wait at the ward window for Edward to walk past and give him sweets or an apple. ‘These were happy days’ (pg 1) is what he writes at this memory. His turbulent home life is contrasted with the peaceful atmosphere when he moved in with his wife’s ‘salvationist’ parents, where he claims that he had his ‘first experience of coming home on a Saturday night and finding all at peace’ (pg 5). Benson, John. The Working Class In Britain 1850-1939. 2003, I.B Tauris. London.